I will admit I am not a big fan of Bullard after his QE4 “intervention” a while back, but the guy was spot on when he said that this stock market decline was the most predicted stock market decline in the history of financial markets. He did, however, fail to mention that almost everyone predicting it lost money on trying to trade it. We have been hearing the same thing every single day for possibly a good 4-5 years now. All the way back from when the S&P was as low as $1100 we have been reading posts by Zerohedge and other financial pundits that the stock market is going to crash, yet it hasn’t. Now the stock market has declined some 10% and the level of chatter around this being a turning point, a top, in equities seems to me at a huge extreme. You can almost sense the satisfaction that the market has declined in certain participants that have repeated over the last years that it will crash. I usually take signs like this as a strong contrarian signal. Thus, I almost feel like despite the near all-time-high levels of S&P500 there is a rather extraordinary amount of Fear and the contrarian in me can’t help but be bullish. However, let us put things into perspective. It is very easy to loose sight of the big picture when volatility explodes, everyone is screaming and is predicting a top. 10% decline is hardly huge and from a pure statistical prespective the move lower hasn’t been that aggressive. One needs to remember that a 100 point move in the S&P 500 when it is trading @ 2700, % wise, is not the same as a 100 point move when the S&P 500 was trading at 1100. We are talking about declines of 3-4%. Downside usually tends to be considerably more aggressive in PA than upside, so again that needs to be factored in. Statistically speaking we aren’t even close to crashing, crash would be a 10% move in a day. Trying to attribute the downside to the FED decreasing its balance sheet or to bonds might have some longer-term merit to it, but is definitely premature at the moment. Things have hardly really moved or changed with that regards. This correction has been long needed and long awaited to keep the upside healthy, as a matter of fact, it came way too late and would have been healthier for it to occur earlier. Anything less than a 20% correction doesn’t even change the trend the short term, keep that in mind. A 50% decline in the stock market will take it to 1400, double the prior 50% correction from 2008 @ 700 and things aren’t even remotely close to being as bad as 2008. If you add all the price action from this week what you will get is S&P falling into a pretty huge support level and while that is holding, we can’t even start to being to make a case for a real reversal, so let us examine an upgraded S&P500 chart. As one can see fairy clear we are getting pretty good support from the 2520 level mentioned last week. The reaction from the level now twice, would have gotten the trade free. While 2433 holds difficult not to expect new highs. In the even of a break of 2400, big support comes at 2200. Only a move under 2200 would personally turn me into a seller for a longer term in Stocks. Move under 2200 would have me look for a move towards 1400 for a full 50% retracement. Bears need to hold the 61.8% retracement from highs, roughly at 2740 or new highs are imminent. Admittedly the test of the micro 50% @2700 produced the re-test of 2520, thus it is possible for us to go down to 2400 to complete larger 3 wave correction and test the 61.8% of the extension long that is trading @ 2520. What we can say is that longs still remain in control with no break of any immediate next in the series long setup. Break under 2400 should give us 2200 and only under 2200 can we talk for a bear market. While above these levels, I remain of the view that we are seeing healthy correction lower. Sterling has mostly completely filled my downside expectations and I have closed 70% of my position with the remaining 30% eyeing 1.36. At this point I won’t provide a chart update as I consider myself mostly done in this trade and I want to get more information. EURUSD has been a bit more stubborn and at this point is lagging behind other USD crosses. I don’t see any real support until 1.205 at least and continue to patiently wait for more downside while we remain under 1.265, but I have closed 50% of my initial EURUSD position and moved my stops @ BE. Generally a move above 1.241 technically should signify new highs. Thus on a move above 1.25 again I will be looking to re-short @ ~ 1.257 with my risk range for flipping being between 1.265 and 1.27. I will admit that the stubbornness of EURUSD has me somewhat concerned but at the same time my conviction will likely grow stronger the stubborner it becomes as long as it traders under the larger levels. It is also possible the EUR needs some news as a catalyst, and truth be told it can also just decide to go full-blown bullish, but I remain patient, having partial success with the trade and closing half of my position for 1.3% /without leverage consideration/ net gain. Here is an updated look at the short-term EURUSD chart and a reminder of what I am looking at in terms of larger levels. We broke the 61.8% and spiked into the 6,000 level, something I pointed as likely in my prior post. 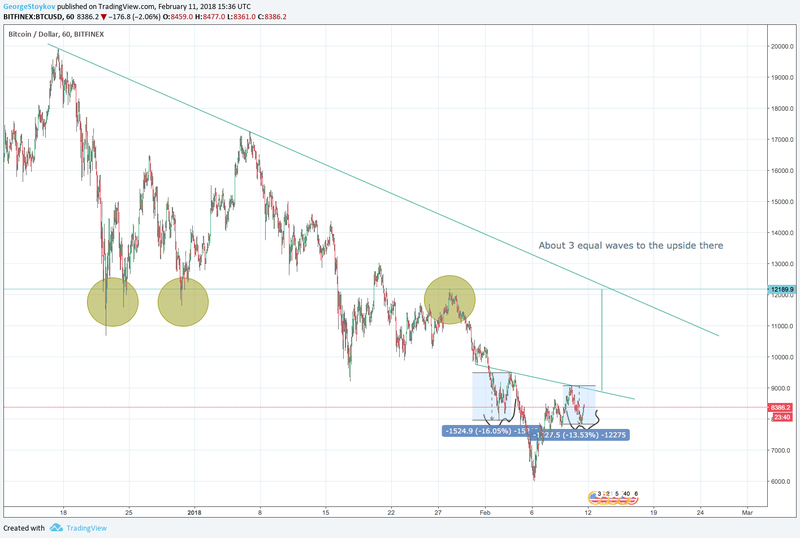 At this point it is difficult to say what to expect, but I am seeing some short-term bullish signs and I think a move to 10-12k is possible. However, the overall sentiment around BTC seems like there remains an extraordinary amount of arrogance and over-confidence and I feel like the downside is not done. I will refrain from being more specific at the moment, because I can’t see any interesting tradable patterns outside of the fact that we touched the trend line I pointed in my post Blood moon, S&P 2800, EURUSD 1.25 and Bitcoin and rejected from it. 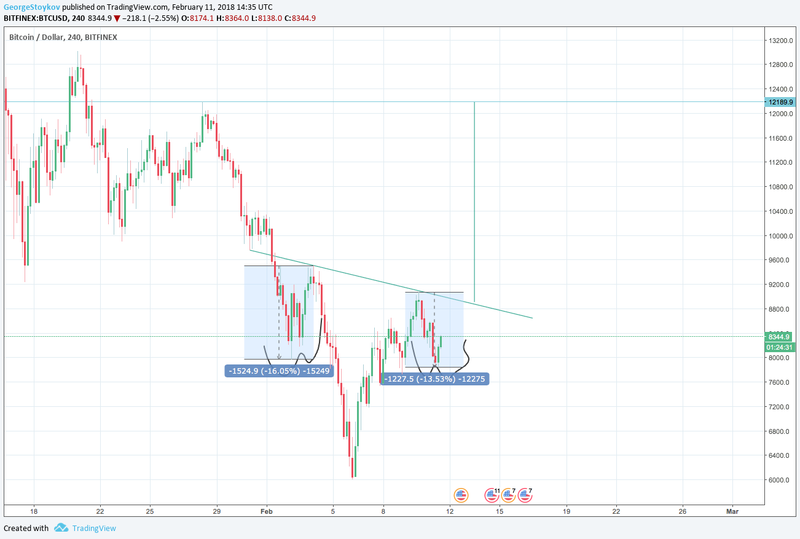 I was just looking at the BTCUSD and noticed the possibility of setting up an Inverse H&S that actually looks decent and aligns with my overall view. The IH&S needs to be confirmed with a clean break of the Neckline, but in case it gets confirmed it will target 12k which will aligns with 50% retracement from all time highs in the form of 3 waves correction to the upside of equal lengths. Thus, I like this scenario as it bodes well with my expectations for some upside now but not enough pain for the Crypto world.